I’ve tried to get an iSight photobooth set up at previous BarCamps only to run into technical challenges or lack of interest. It was also probably not the best idea to leave a personal laptop lying around in the middle of an event open to the public when really your only goal is to capture photos of attendees primarily for posterity. 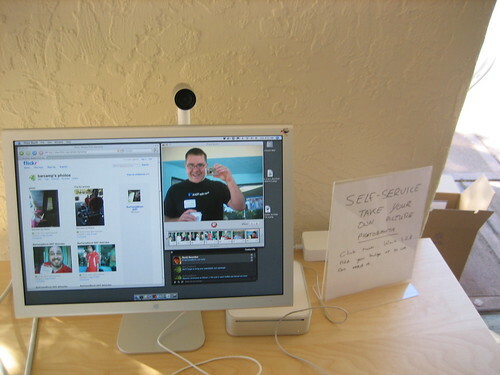 At BarCampBlock I renewed my determination and decided to lug down the Citizen Space Mac Mini, our 21″ Cinema Display, a keyboard, mouse and an old skool iSight to make it happen. You can check out our simple setup in the photo above. Getting the system setup wasn’t that hard, especially with the reliable mesh network the folks from Meraki had setup for us. I used an app called Flickrbooth (written by Tristan O’Tierney in response to a lazyweb request I had put out in January of 2006) to upload the photos directly to the BarCamp Flickr account. I then took a photo of myself to demonstrate what people should do (hold their name tag up next to their face so we could read their name and tag them later) and then opened that photo in Preview on the desktop so people would get the idea. After awhile, I decide to open up the barcampattendee tag page on the BarCamp user so people could also see that these photos were being uploaded as they were being taken. I also installed Twitterrific and set it up to post to the BarCampBlock account; it turned out that not a lot of folks ended up posting to the account but they could still watch what people who were subscribed to BarCampBlock were saying. I may be late to see this, but I’ve tweeted it and think it’s an idea that would work for lots of events. Kudos!